“An astonishing feel, rejuvenating nature, and culture; there is no boundary of happiness in your adventurous life- stand on top of the world’s eight highest peak, Mt. Manaslu (8,163 m/26,781 ft), we present you an extensive 45 days incredible journey of your life”. Manaslu is the eighth highest mountain in the world at 8,163 meters (26, 781 ft) above sea level. It is located in the Mansiri Himal, Gorkha district, in the west-central part of Nepal. 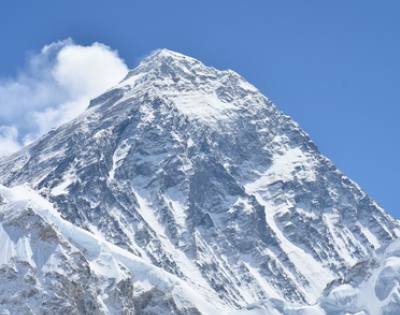 Its name, which means "mountain of the spirit", comes from the Sanskrit word Manasa, meaning "intellect" or "soul"
Mount Manaslu was first summited on May 9, 1956, by Toshio Imanishi and Gyalzen Norbu Sherpa, members of a Japanese expedition team. This Japanese team completed the first serious endeavor to ascend the peak in 1953 from the Budhi Gandaki valley. Mt Manaslu is highly demanding climbing peak among 14 over 8,000 meters peaks in the world. While climbing up way to Mt. Manaslu, we have an amazing backdrop with a view of Ganesh Himal (7,422 m/2,4350 ft), Ganesh Pabil (7,140 m/23,425 ft), Shringi Himalaya (7,161 m/23,494 ft), Himal Chuli (7,893 m/25,896 ft) along stunning valley landscape. However, the expedition is considered as one of the most technically challenging expeditions in Nepal. Before the summit of Mount Manaslu, we will set up 4 high camps above Base Camp (4,800 m/15,748 ft). The Camp I will be setting at (5,500 m/18,044ft), thoroughly Camp 2 will be at (6,300 m/20,669 ft), Camp 3 will be at (6,800 m/22,309 ft), and Camp 4 will be at (7,300 m/23,950 ft). There are two different trekking routes to reach Manaslu Base camp. A bus drive from Kathmandu to Besishahar – Dharapani, Tilche, and trek to Vimthang via Larkye pass (5,106 m/16,752 ft), or take a bus Kathmandu to Arughat – Sotikhola, and trek to Samagau through Buddhist bulking lands. However, we Himalayan Diamond Adventure will follow the Budi Gandaki River valley trail up to Sama village and then we head up to Manaslu Base Camp. We set up a permanent Base Camp at 4,800 meters (15,748 ft), for a long expedition. After short traversing from Manaslu Base Camp, we carefully follow the bamboo marked poles and use fixed ropes to cross the hindrance crevasses and dangerous sections. We make our Manaslu expedition Camp 1 at 5,500 meters (18,044 ft) at the bottom of the North Peak right above the glacier on a protected area. 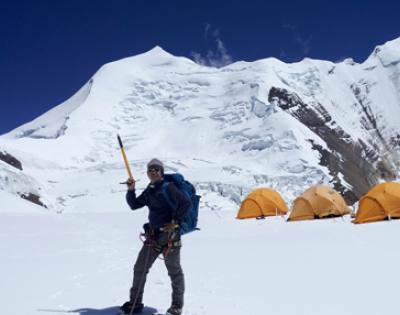 Likewise, Camp 2 is located at 6,300 meters (20,669 ft), the safe section of the climbing. Although while at this campsite there can be a lot of snow buildup. The climb from Camp 2 to Camp 3 is one of the shortest and only takes around 3 hours. We set up our Camp 3 at the elevation of 6,800 meters (22,309 ft), just below the col to avoid the very strong winds so we ensure that all our tents are anchored properly. The route continues up the remaining glacier climbing steep sections of snow and ice with safety towards Camp 4 at 7,400 meters (24,278 ft), which is the last camp before push summit. The Summit day starts in the late evening, and the route heads immediately up a moderate slope from the summit camp before arriving at the first of the summit tables. The route climbs three separate levels before arriving at the final pyramid slope. From here another short steep slope below the immediate summit is climbed until we reach the pre-summit. The ultimate summit is reached by an exposed technical traverse for around a distance of 70 meters– this section needs to have fixed ropes in place. The climb from Camp 4 to the summit takes between 6-9 hours with 3-5 hours for the descent to Camp 4. Next day, we return to Base Camp to end our successful attempt to climb magnificent Manaslu. Day 45: Departure for home, say good bye. Welcome to the land of white glowing mountains. While flying to Kathmandu along the northern border of Nepal on a clear day is in itself an exciting and memorable experience as an exotic panoramic view of snow-capped Langtang, Ganesh Himalaya ranges peaks come into your sight before your landing In Kathmandu Tribhuvan International Airport. Then the representative from Himalayan Diamond Adventure will have reached there to welcome you. After landing your aircraft, we come to pick you up with our welcome greetings. Collecting your luggage, we drop you off to the hotel. You will have welcome dinner with Nepali cultural dance restaurant along with your guide’s briefing about the day program tomorrow. Overnight in the hotel (Service includes bed and breakfast). Our climbing guide will meet you in your hotel after your breakfast time, to check your necessary climbing gears and equipment for trekking and peak climbing. If you are not well equipped, the guide will give the advice to buy or hire gears in trekking shops of Thamel. Our group leader and company permit representative will attend to Nepal government permits department office, Nepal tourism board in order for a formal briefing about our expedition. And rest of the members can make Kathmandu valley sightseeing, the UNESCO world’s heritage site with our city guide. Our staffs will come to the hotel around 07:00 AM to pick up you with private vehicle for Arughat, Soti Khola drive today. We will have a scenic drive approximately 11 hours to Soti Khola. From Jeep station Gongabu Kathmandu in the local deluxe bus, we will begin our journey. The company has already booked your lodge in Soti Khola where you have to spend the night. The road passes with fascinating ground landscape and mountain terrain views of major peaks, Manaslu, Ngadi Chuli, Himal Chuli, Rani Peak, Baudha Himal, and Ganesh Himal. Overnight at the lodge (service includes dinner and breakfast with a cup of tea or coffee). Leaving of Soti Khola, we trek to Khorla Besi, the trail cross many tributaries, hamlets, cultivated lands, well-made bridge, and beautiful sal forest. Further, the trail climbs onto a ridge above huge rapids on the Budhi Gandaki River. Trek crosses rocky vertical walls following Budhi Gandaki up River. Along the way, the trail weaves its way up and down many to reach Khorsane, Machhikhola Gurungs tea houses, and shops. Eventually, we reach to Khorla Besi walking off 7/8 hours from the last night. Overnight at the lodge (service includes dinner and breakfast with a cup of tea or coffee). Leaving Khorla Besi, we trek start to Jagat. The trail more gradually ascends up, through the huge Tatopani (hot spring) gorge crossing the Budhi Gandaki River twice and others side Rivers of Budhi Gandaki. Finally, we reach Jagat walking off 7 hours continue up on the rugged trekking route, passing many scattered hamlets, bridges, and the farmer’s farmlands with beautiful scenery from the last night. Overnight at the lodge (service includes dinner and breakfast with a cup of tea or coffee). Leaving to Philim village, the trail gradually ascents up following the Budhi Gandaki River, and crossing the side Rivers of Budhi Gandaki with a captivating view of Shringi Himal, many Gurungs inhabited settlements and cultivated the farmer’s farmlands. Finally, we cross Budhi Gandaki River over the well-made suspension bridge, then short climbing up to Phillim village. Where the trek ends of the day. Overnight at the lodge (service includes dinner and breakfast with a cup of tea or coffee). After breakfast, our trek starts to Bhimphedi, the trail moves to towards new bridge and then Dang village. After crossing the bridge over Budhi Gandaki River, we trek into the huge gorge and shady woods and bamboo forest more gently way up. Finally, we cross again Budhi Gandaki River along the bridge then trail steeply rises up for short walk uphill. Our track then turns on the easy way to reach Bhimphedi. Overnight at the lodge (service includes dinner and breakfast with a cup of tea or coffee). Leaving to Namrung, the trail more gently ascents up to the Prok and Gap villages through Tibetan Sherpa farmlands, crossing the Rivers over well-made suspension bridges and cliff canyon way. Then, the trail moves towards under the green forest for 02 hours gently way up to Namrung village. Today, we can have a WIFI service and a nicer lodge then the last night. Overnight at the lodge (service includes dinner and breakfast with a cup of tea or coffee). Today, we trek to Syala valley throughout Tibetan Buddhist villages, with fascinating mountain view and local inhabitants unique culture, typical lifestyle. The track passes eye-catching mani walls, monasteries, the farmer’s cultivated lands, lodges, scattered villages, river, and forest with a magnificent view of the worlds eighth highest Mountain Manaslu. After walking off 6 to 7 hours continue more gently up way along the nature trail, we reach to Syala valley, which is the more possibly tourist destination in this remote area with the superb Mt Manasalu view. Overnight at the lodge (service includes dinner and breakfast with a cup of tea or coffee). Pung Gyen gompa valley is fabulous for a side trip and good enough acclimatization for Manaslu round trek. The Pung Gyen gompa is above Pung Gyen glacier and lap of Mt. Manaslu and Mt Ngadi Chuli Peak 29. It’s summer Yaks and horses grazing the land, where a small monastery is situated. It belongs to Lord Milarepa. After sending some wonderful moment in this paradise, we trek back to Samagaun. Sama gau is also a more possible tourist destination in this remote valley with the captivating Mt. Manaslu. Overnight at the lodge (service includes dinner and breakfast with a cup of tea or coffee). Today is a very exciting day as we will reach the Manaslu Base Camp. After a usual breakfast, we head up to base camp. The trekking route moves towards to Manaslu Base Camp along the Samdo village way not yet crossing down following tributary, and then our base camp trail ascends up way under the tree. After walking off 4 hours continue up way with our background stunning valley landscape and mountain view, we reach Base Camp. Today, we have got our own separate tents where we can relax as we like after meeting with our base camp staffs. We will have got own crews, kitchen tent, dining tent, table chairs, storing tents, and shower tents. The beginning expedition to the ending of expedition and garbage management too. There is available of hot and cold drinks anytime in our dining room so you can serve it as you like. After some relaxing on base camp, our group leader will brief us about the expedition, such as base camp management rule, training, and climbing. Overnight at the camp (service includes dinner and breakfast with a cup of tea or coffee). We need to climb for 25 days in order to reach the top of Mount Manaslu. We will set four camps above the base camp before reaching the top of Mount Manaslu. We will also have rest days for proper acclimatization in between while ascending the peak before taking the first expedition to Manaslu glacier. The climb commences after we pace on to Manaslu glacier. The path here will be profoundly crevassed. Moving ahead, we will reach the camp I, which is located on a secluded shoulder at the top of Manaslu glacier. Also, there are fixed ropes, which are necessary on most of the path on the way between Camp I and Camp II. Camp II is located in the flat location safe of a threat, though the site can have heavy snow amassing. This is supposed to be the most challenging section of the Manaslu peak climbing. The way now constantly moves up all the way through the upper glacier to reach Camp III. Camp III falls on a flat saddle lying just beneath the col, here we may experience strong storms. While ascending from Camp III to Camp IV, we will walk up the glacier knitting through some vertical sections of snow and ice where fixed ropes necessary. As soon as we arrive at Camp IV, we will move toward the summit of Mount Manaslu. The peak is reached with one of the challenging traverses for less than 100 meters in linear distance. Overnight at the camp (service includes dinner and breakfast with a cup of tea or coffee). We will switch back to Sama Gaon this day, we will walk through the archetypal alpine forest and then depart from the 500 years old village, Samagaon the next day. Overnight at the lodge (service includes dinner and breakfast with a cup of tea or coffee). Leaving towards Samdo, the trail more gently ascents up with unusual landscape following upstream Budhi Gandaki and crossing side Rivers of Budhi Gandaki. The track moves ahead through Juniper, rhododendron, blue pine trees, and yaks pastureland. Finally, we cross the Budhi Gandaki River over the bride and climb up on the strenuous trail for short distance to reach Samdo village. Overnight at the lodge (service includes dinner and breakfast with a cup of tea or coffee). Today, we wake up early in the morning at 3:30 AM for Tea with breakfast, then we leave up to Pass, ascending gently uphill with lightning on dawn. After walking some hours, we reach to glacier and moraine. It’s difficult to make a pass with the chilled wind, moraine, and glacier traverse but the stunning landscape will keep us moving forward. From Larkye pass, we can have a mesmerizing view of Annapurna Himalayan range and around circular Mountain View. After crossing the Pass, the trail steeply descends to Vimthang village making a long walk. Overnight at the lodge (service includes dinner and breakfast with a cup of tea or coffee). Leaving Vimthang lodge, the trail descends several times down under the rhododendron, pine, and bamboo forest through pasturelands, Buddhist farmlands, following downstream Dudh Kola. The path crosses moraine, glacier, side Rivers, and Thakali villages, like Gho, Tillje, and Thonje on the way. Finally, we cross the Marsyangdi River over a well-made suspension bridge and reach Dharapani. Overnight at the lodge (service includes dinner and breakfast with a cup of tea or coffee). After incomparable Tsun valley including Manaslu Larkye pass trek, today we drive back to Kathmandu. It takes normally 10 hours from Dharapani to Kathmandu in Jeep and tourist bus. Overnight at the hotel (service includes bed and breakfast with a cup of tea or coffee). Kathmandu is a historical and cultural heart of Nepal. It is a popular destination for tourists, trekkers, and adventure seekers. The city presents a wonderful mixture of Hinduism, Tibetan Buddhism, and Western influence in the Valley. Patan and Bhaktapur are its two major neighboring cities, which bear immense historical, cultural, and religious significance. There will be a half day guided tour to the famous & biggest Hindu shrine Pashupatinath temple, the largest Buddhist stupa in town Boudhanath, the 15th-century palace of 55 windows Bhaktapur, and Swayambhunath stupa. In the evening farewell dinner. Its relaxing day or shopping day, you are free, you can make side trips around the valley. This evening company through farewell dinner in tourist standard restaurant at Thamel or around. We drop you in Trivuwan International Airport in the terminal room in your flight departure time by tourist Bus or a Car and say bye. Note:- The conditions stated in the itinerary are especially for the trekker who prefers full package service. At the same time, we also customize itinerary based on your choice and time. The selection of itineraries and the staffs depends on your need and financial procurement. We have options for any partial visit as per your requirement and financial condition. Transportation: Airport pickup and drop-off by tourist bus or car depend on group size. Four nights 3 star Hotel in Kathmandu sharing twine bed with included breakfast service. Transportation: All ground transportation with member’s luggage will be included as mentioned in the Itinerary. Menu on client’s choice, Three times meals in a day (Breakfast, Lunch, Dinner & Dessert), with hot drinks, (tea and coffee) during the trekking. Entry permits: Peak royalty, Special Manaslu permit, MCAP and ACAP fee. All necessary trekking and peak permits. Guide summit Bonus USD 1000/- Carrying Bonus separate for Sherpa. Garbage Management :Stool Shipment Transfer & Garbage Deposit fees. All necessary Rope fixing team charges. Oxygen (O2):- 4 liters Poisk oxygen cylinder bottle or 4 liters Russian oxygen cylinder bottle each member 3 bottle oxygen cylinders and 01 oxygen cylinder bottles for high altitude Sherpa. Mask & Regulator: 1 set of Summit Mask & Regulator each member and each support climbing guide or guide and one spare Mask regulator in a team. Guide and support climbing guide Equipment, daily salary, lodging and food on the way, transportation and accommodation. Base camp chef: well trained chef with all his equipment, daily salary, lodging and food on the way, transportation and accommodation..
Base camp staffs:- Kitchen staffs with all his equipment, daily salary, lodging and food on the way, transportation and accommodation. Our base camp meal service: We serve you made by fresh vegetable and fresh meat very hygienic foods with verity hot and cold drinks. Base camp services:- North Face or Mountain Hard ware single tent with comfortable Mattress. Base camp grouping services: Carpeted, heated dining hall, Kitchen tent, Store tent, communication tent, Toilet tent and Shower tent water proof compact mat with down filled mattress and luxurious arm chairs with stable table. Service of higher camps we provide, sufficient necessary equipments, gears and high foods. Necessary cooking Gas, EP gas, cooking pots for member , high altitude tent, high food for Support climbing guide and guide and climbing grouping gears, like Static ropes, Guide ropes, Snow bars, Ice crews, Lock and non Lock necessary carabineers, (C1), (C2), (C3) and (C4) and summit. Strong and helpful porters with proper equipment and side porter, Yaks transportation. Nepalese Staffs Insurance Policy covered it rescue evacuation, medical treatment and accidental. Welcome and Farewill dinner in tourist standard restaurant. Personal trekking and climbing equipments and gears. Any entry fee for temple or monastery, donations or charity. Climber’s Travel insurance policy should be covered it emergency helicopter rescue evacuation, medical treatment and accidental. Your personal expenses like; Hot shower, Laundry, Battery charging, telephone and shopping during the Lodge trek. Alcoholic and non alcoholic hot and cold drinks, during the trek. Tips for the guide, Kitchen staffs, porter and driver (tipping is expected). Climb peak with mountain leaders with comprehensive service. We Himalayan Diamond Adventure render you 3 stars hotel in Kathmandu for 4 overnights with breakfast service. If you are not well equipped for the trip; you can hire the gears with us at its reasonable price. We Himalayan Diamond Adventure provide you genuinely tested gears of the Union of International Alpinist Association(UIAA) such as La Sportiva Climbing boot, Black Diamond:- Helmet, Harness, Ice ax, Crampoon, Carabineers or Grivel and Petzel too. To reach the base camp of Mt Manaslu, we will have a scenic bus journey Kathmandu to Arughat – towards Solikha. The trail passes following Budhi Gandaki River valley through beautiful isolate Buddhist faith and Tibetan-influenced culture villages, with stunning Mountain View. After 8 days of the fabulous hike, reach the Base Camp 4,800 meters (15,748 ft). For the period of trekking, we stay in lodges with comprehensive service and on-base camp intent. It needs earlier mountaineering experience, good level of physical fitness, and a minimum of 45 days holiday to make a successful expedition. Before commencing the climb towards the summit, we guide you a lot about the climbing knowledge on the Base Camp. "As our first motto is ‘Best Guide Safe side’ thus, you can test your physical ability of climbing skills and effect of altitude"
Mount Manaslu (8,000 m/26,246 ft) is one of the most attractive mountains to climb in Nepal. We highly recommend you climb Mount Manaslu from August 25 to October 10, if you are in a quest for 8,000 meters (26,246ft), climbing experience without any moderate-difficult and having invested less amount of money and in less time, or you are looking for to climb Mount Everest in the near future. We truly lead you to make a lifetime climbing experience with us. We are very professional and an effective organizer in all round. We have a good chef, very professional guide in mountaineering who are highly experienced in mountaineering, very strong and very caring personals as your climbing guide. We also provide you genuine tested gears of the Union International Alpinist Association (UIAA) sufficient climbing grouping equipment and gears. Apart from this, such climbing requires highly mentally and physically well-prepared individuals. After all for safe climbing, that’s on your hand. To make your Mt. Manaslu expedition 100% success, we provide you minimum 1 mountain guide certified by the Union Internationale des Associations de Guides de Montagnes (UIAGM) in French, Internationale Vereinigung der Bergführerverbande (IVBV) in German is the International Federation of Mountain Guide Associations (IFMGA), and rest of support climbing guides are completed advance mountaineering guide course under the Nepal Mountaineering Association (NMA) and Nepal Mountaineering Instructor Association (NMIA). Also, most of them are recently Manaslu summiteers. They are very strong and helpful with wide knowledge. They are very skillful in setting up our routes and map navigation, weather forecast and rescue too. I am the first Everest Summiter from South–East side of Nepal in Kirant Khaling Rai community as being a guide. I am also the founder of Himalayan Diamond Adventure (P.) Ltd. I am looking some interested climbing partners for Manaslu expedition in 2019. Our expedition will starts from August 22, 2019, and it ends October 7, 2019. Are you interested to attempt the summit of Manaslu together with me? Please feel easy to contact me. I will get back to you myself and be assured with us your information will remain safe. We will set up our permanent expedition base camp for as long as the Manaslu expedition continues. Each of the members has a personal big size North- face VE 24 dome tent with a waterproof compact mat with down filled mattress for your comfort. We provide a carpeted, heated dining hall with luxurious armchairs, and clean fascinating table with solar electric light, which makes your base camp stay as luxurious and amusing. We have a separate storing tent, shower tent, and toilet tent; all is in perfectly hygienic condition and order. All members of the climbing guides have their own two people sharing a tent, along with dining hall and store tents. We have a well-trained expedition chef at base camp to cater great meals, and expedition team manager to deal with all the required logistics necessary for a successful expedition. We serve you a fresh vegetable, fresh fruit, fresh meat, and bakery items. Our chef prepares us only hygienic meals with a variety of hot and cold drinks (Coke, Juice, beer, wine, and hard drinks) as you like. If some climbers are interested to prepare a meal on their own style, they can join in the kitchen. We stay most of the nights at base camp for proper acclimatization before we head to the higher camps. During our stay at the base camp, we will guide you about very essential climbing techniques, glacier walks, walking on the slope, ascending, active rappelling (up sailing), safety placement, use of oxygen, mask, and regulator etc. Our guide and supporting climbing guides will hike to Camp 1, Camp 2, Camp 3 & Camp 4 to set up all camps up to camp 3 and deposited all necessary climbing equipment, gears, foods, O2 etc. After setting up Camp 3, our guide leads you to Camp 1 for Overnight. Next day, you come back to Base Camp. After a few days of staying in Base Camp, the guide leads you to Camp 2 and back to Camp 1 for overnight. The following days you come back Base Camp for rest. Afterward, you climb to Camp 2 for overnight, and the next day you will touch Camp 3 and again trek back to Base Camp. After some relaxing days in Base Camp, the guide take you to Camp 1 for overnight, and if you are in good health the guide leads you to Camp 3 for overnight and descend to Base camp following day. During the acclimatization period, our rest of support climbing guides will have finished to set up Camp 4 and route setting or fixing roped on slopes. And, then the guide ensures that all the high camps are well stocked with tents, food, and oxygen for the summit push. We return to base camp for rest and recovery before we attempt to make the summit. After getting confirmation of a favorable weather forecast, we head up with our summit plan to Camp 2, Camp 4, and then the SUMMIT. There will be one Climber and one support climbing guide ratio to ensure that every climber has complete support to enable them to scale the summit and return to Base Camp safely. Himalayan Diamond Adventure provides all the expedition group climbing gears including all high altitude tents, mat, solar lights, dining tent with chairs and tables, each climber 4 liters of 3 cylinders Russian/ Poisk Oxygen and some extra cylinders Russian/ Poisk Oxygen, each climber each pair Summit masks regulators, and some spares masks regulators. We provide you the mountain hardware or marmot two men dome tent with a waterproof mat for all higher Camps. The tent should be shared between the two climbers, or you can share your tent with your guide in case you become sick at night- your guide can take care of you. We provide sufficient and tasty hygienically prepared food at Base Camp and all the higher camps for the period of your expedition. Plenty of high altitudes foods are provided at higher camps. All the expedition load carries from base camp to all the higher camps are included in the trip cost While, most of the other expedition operators charge as an extra. After proper acclimatization and well prepared to push the summit, we will ensure a favorable weather forecast. We always stand on our quality of weather forecast service. It's affiliated with government of Nepal (Meteorological Division) Mountaineering is itself dangerous cause of high altitude, frostbite, hypothermia, blindness, snowfall, rock fall, avalanches, crevasses, and white out. However, if we are well equipped, we can avoid the high risk. We are very aware of a possible happening accident in the mountain, so ensure first our safety and then we go to the summit. In case climber face that unpleasant incident, we have a facility of 4 liters Russian Oxygen cylinder with summit mask regulator for emergency cause and all required treatment aids with the guide. That means we are stand-by against any danger in the mountain. Besides these, the guide, as well as the climbers, would be carrying the Satellite phones or Radio sets to approach communication service. Otherwise, focusing the major subject safely, we will arrange all in time even call the Rescue Team or Helicopter and take you down to the low elevation.